How and when was Buddy Bike started? What is the mission of Buddy Bike LLC? Why should I buy a Buddy Bike? How is the Buddy Bike different from a regular tandem or tag-along? Which Buddy Bike model would be best for my family? How will the Buddy Bike benefit my special needs child? Who may benefit from riding the Buddy Bike? When will my child outgrow the Buddy Bike? Is my child tall enough and old enough to ride? Can I ride the Buddy Bike with my spouse? Are the pedals on the same drive chain? Can the front riders pedals be disconnected? Where can I buy adaptive accessories? Where can I buy a Buddy Bike? Where can I try a Buddy Bike? Where will I store the Buddy Bike? How can I transport the Buddy Bike? HAVE MORE QUESTIONS? SEND THEM TO shelley@buddybike.com. How and when was Buddy Bike started? The concept of the Buddy Bike began over 10 years ago. Robert Gardner of Willits, California designed a bike which he called The Love Bike because he needed a way to carry his young son around. In 2003, Barry Nelson, the father of an autistic child, purchased a used Love Bike. He was so enthralled by the opportunity this bike gave him and his son, Jesse, that he contacted the inventor then created a Trust for Jesse and used those funds to purchase the patent and remaining inventory. We work together with Bob to continue producing and developing what we now call The Buddy Bike. Basically, Buddy Bike exists today because of the love of two fathers for their sons. What is the mission of Buddy Bike LLC? 1) To promote cycling and bring the cycling experience to families who might not otherwise be able to ride a bicycle. 2) To bring the Buddy Bike to as many special needs families as possible. 3) To open Buddy Bike shops across the country where people can rent Buddy Bikes and take guided tours. Why Should I buy a Buddy Bike? The Buddy Bike is the alternative tandem bicycle. If your small child or special needs child is too big for a child seat or a tag-along bicycle and you don't feel safe with them riding behind you, the Buddy Bike offers the safety of having your child ride in front of you. You will be able to ride more comfortably with your arms around your child as you can observe what they are doing and easily give words of encouragement or talk about the sights around you without having to turn and shout to them in the wind. How is the Buddy Bike different from a regular tandem or tag-along? A typical tandem bike places the "captain" in the front seat; the captain steers the bike and controls the brakes while the "stoker" rides in back. The Buddy Bike reverses those positions putting the stoker in the front seat. In our case, the stoker is usually a special needs child. By placing the child in front, it creates a more interactive bike riding experience. Parents can speak right into the ear of the child, rather than shouting at them in the wind, and the child has an open view of the world around them rather than just the back of their parent. On a tag-along, the pedals are not connected and the child rider may not pedal or receive exercise. They are merely being dragged along behind. On the Buddy Bike, your child will love being out in front with only the road ahead, feeling like they are in charge, but knowing they are still close enough to receive encouragement and support. Parents are also thrilled to have their children in front of them where they can monitor the child's activity and make sure they are not randomly jumping off the bike! Which Buddy Bike model would be best for my family? We have created a Buddy Bike Side-by-Side Model Comparison to help you choose the right Buddy Bike for you and your family. If you need further assistance, please contact your local Dealer or contact us at shelley@buddybike.com or 786.489.BIKE (2453). How will the Buddy Bike benefit my special needs child? The innovative features of the Buddy Bike provide the alternative to tandem cycling, tag-alongs, trikes and infant seats. 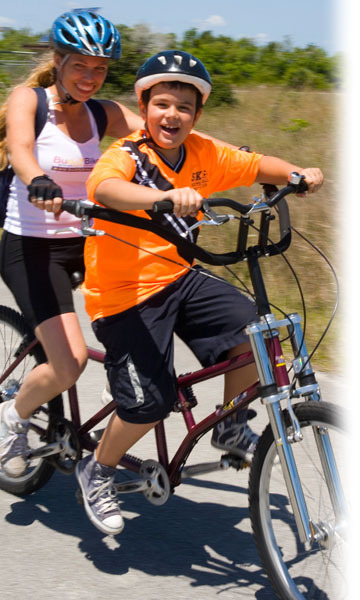 The Buddy Bike offers special needs children an opportunity for adaptive outdoor recreation and therapeutic activity. Special needs children may benefit from: safe and interactive cycling fun, adult is close enough to speak words of encouragement into the child's ear rather than shouting at a child riding behind, opportunity to work on child's communication skills while riding, an opportunity for growth and development and child riders who can pedal will receive exercise which directly combats obesity. To read more about the benefits of the Buddy Bike, visit our Special Needs page or read the stories and comments of the families that are using the Buddy Bike at Customer Comments or our Buddy Bike Stories pages. The Buddy Bike has been officially tested, rated and recognized as a product that is friendly for children of all abilities by AblePlay. Visit our product listing at AblePlay to review the report by the National Lekotek Center about the Buddy Bike and its applications and benefits for special needs children. Parents may find this information to be useful in their search for funding. The National Lekotek Center is the leading authority on play for children with disabilities. Who may benefit from riding the Buddy Bike? Children with Autism, Down Syndrome, Aspergers, Fragile X, sight impaired, hearing impaired and children with cognitive disabilities. Recent studies are showing that riding a bicycle can reduce tremors in patients with Parkinson's Disease. Riders with severe physical disabilities may not be able to ride the Buddy Bike. Riders must have enough trunk strength to sit upright on a standard bicycle seat. Adults who have never ridden a bicycle can also learn to ride on a Buddy Bike. To read more about the benefits of the Buddy Bike, visit our Special Needs page. When will my child outgrow the Buddy Bike? The Buddy Bike safely supports a total weight of up to 380 pounds. Two adults can ride together so you will be able to enjoy the Buddy Bike for many years to come. There aren't any height restrictions but it is necessary that the rear rider is able to see over the front rider's head in order to safely steer the bicycle. There aren't any specific age ranges either. Is my child tall enough and old enough to ride? If your child can sit upright on a standard bicycle seat, they can ride the Buddy Bike. Front seat riders must have an inseam of 25" to be able to pedal. For smaller riders who can't reach the pedals, fold-out foot pegs provide a place to rest their feet out of the way of the pedal motion path. Foot pegs are sold separately. Can I ride the Buddy Bike with my spouse? The Buddy Bike safely supports a total weight of up to 380 pounds. Two adults can ride the Buddy Bike, making it the ultimate family bike that can be enjoyed by riders of all ages. It can be ridden alone but it is much more fun to enjoy the close intimate ride of the Buddy Bike. The Buddy Bike is shorter in length than a typical tandem and provides less leg room for the rear rider but casual riders will enjoy the cruiser bike ride and being close enough to converse and give an occasional romantic kiss! The Buddy Bike is also a great tool for teaching adult riders to ride a bike for the first time. Are the pedals on the same drive chain? Yes. There are two bike chains connected to the same drive chain. The pedals work together. The front riders cranks are slightly smaller than the rear set. The benefit is that you will move the pedals of the front rider and if you can place the feet of the front rider on the pedals, you will provide physical activity which directly combats obesity, increases blood flow and may help to improve leg movement and flexibility. If the front rider can't keep their feet on the pedals, your bike shop may be able to provide toe clips, cages or velcro exerciser pedals to help keep the rider's feet in place. The Captain (rear rider) should adjust their pedal strokes to accommodate the front rider's skills. Slow, smooth, even pedal strokes and patience will help children with disabilities to become accustomed to riding the Buddy Bike. Can the front riders pedals be disconnected? Yes. The front chain could be removed so that only the rear rider's pedals will move the bicycle. We do not suggest removing that chain as the front rider will no longer receive the benefit of receiving physical exercise. The rear rider will also have a more difficult ride as the full weight of the Buddy Bike and both riders will have to be moved entirely by the rear rider. Where can I buy adaptive accessories? For adaptive accessories such as supportive bike seats, pedals that will help hold your child's foot in place or crank shorteners to help riders with less than a 25 inch inseam to reach the pedals, please contact one of the bike shops listed at our Adaptive Accessories section. These shops have staff that are knowledgeable about accessories that will work with the Buddy Bike. Buddy Bike offers some optional accessories which can be viewed at our Products & Pricing page. Where can I buy a Buddy Bike? You can purchase a Buddy Bike from any of the dealers listed at our FIND A DEALER web page. If there isn't a dealer near you, ask your local bike shop to contact us to request a Dealer Package or you can order direct by calling 786.489.BIKE (2453) or by sending e-mail to shelley@buddybike.com. Where can I try a Buddy Bike? Check our FIND A DEALER web page and look for the dealers marked RENTALS or DEMO. If there aren't any dealers with bikes in your area at this time, please send an e-mail to shelley@buddybike.com to sign up for our e-newsletter list. Include your city and state to receive information about Buddy Bikes in your area. Where will I store the Buddy Bike? The Buddy Bike is 82 - 84 inches in length depending on the bike model and the handle bars are 33 inches wide. The aluminum Buddy Bike weighs up to 56 pounds. It is easiest to store alongside a car in a garage. It is not too heavy but it is bulky to lift for storage or to carry up stairs. How can I transport the Buddy Bike? At this time Buddy Bike does not suggest any specific make or model of bike rack for use with the Buddy Bike. The weight of the Buddy Bike varies by model and is between 53 and 62 pounds. This weight is well under that required by most bike racks but due to the size and dimensions of the Buddy Bike, not all bike racks could be safely used. The Buddy Bike is a "tandem bicycle" although it is shorter than the typical tandem. Some bike racks specify that they are not for use with tandem bicycles. For safety, read your bike rack Owner's Manual before mounting the Buddy Bike on any rack. Pick up trucks, SUVs and vans are by far the best option for transporting Buddy Bikes but if you don't have this type of vehicle read what other customers are using at our Bike Racks page. Is there a warranty? Yes. Limited warranty. What is the return policy? If a Buddy Bike order is cancelled PRIOR to shipping we will offer a 100% refund. Due to the expense of shipping the Buddy Bike, once a Buddy Bike has shipped, we do not offer a return policy. All sales are final. Please note that our dealers may offer their own return policy and any sales through the dealers may be subject to those policies. We encourage our customers to try a Buddy Bike prior to ordering if possible. If there aren't any demos in your area, you may find these web pages to be helpful in deciding if the Buddy Bike is for you: Customer Comments, FAQs or our demonstration video at YouTube.